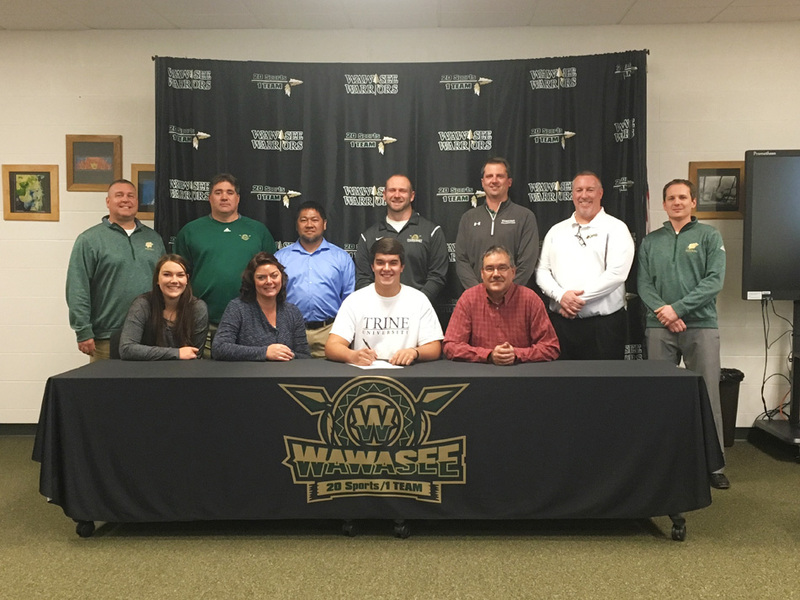 SYRACUSE – Trine University will welcome a fifth Wawasee Warrior to its football program with the signing of senior Hunter Hlutke. The lineman for the Warriors held his signing Monday afternoon at Wawasee High School. Hlutke was a two-way starter for the Warriors on the offensive and defensive line. He started all 10 games his senior year for coach Mike Eshbach. Hlutke was a four-year player in the football program, his junior and senior years with the varsity to where he was named a senior co-captain. A three-sport athlete, Hlutke swam one season and competed in two years of track and now two years of golf, currently playing for the Wawasee golf team. Active outside of athletics, Hlutke was a co-captain of the Super Mileage Team and involved with DECA, ski club and is an Eagle Scout. He carries an 8.72 GPA (12-scale) and is ranked 73rd in his graduating class. He hopes to continue his academic career as a mechanical engineer. Hunter joins his sister, Paige, as college athletes as she is a catcher for the Grace College softball program and is also studying mechanical engineering. Hlutke becomes the fifth Wawasee player to join the current Thunder roster, including Zac McKee, Lucas Garza, Bryce Woody and Trevor Harter. Trine had a fantastic 2017 season, going 11-1 with a perfect 6-0 mark in the Michigan Intercollegiate Athletic Association. The Thunder lost in the Division III playoffs to Wartburg after beating Monmouth (Ill.) in the first round of the postseason. Trine is coached by Troy Abbs.